I know you will already be aware of the wonderful work achieved up on our Reserve throughout the year by the Friends of Beacon Hill, but I wanted to write and update you on the progress of some of the work being done and wonderful achievements over the last year. One of the issues up on the Reserve is the ongoing problem with keeping the ‘scrub’ (the Hawthorn, brambles and Sycamore eye) under control. This growth really does threaten the important chalk grassland we have here and the many species of plants and animals that depend on it. There is a section where this issue has become particularly problematic. It is far from ideal to cut it mechanically and is the least preferred option because of the damage to the habitat (for mammals for example) that it causes. Last year the Friends spent a great many hours carefully hand cutting out these problematic plants in a specific controlled area, next to an area that we had to cut mechanically for grazing, in order to compare the difference. I wanted to let you know of the great results that all this hard work by volunteers has achieved, The re-growth of the ‘scrub’ in the hand cut section has been remarkable reduced this year compared to the mechanically cut area and has improved the quality of the grassland. This promising success and our the altering of grazing timings means I am very confident that by continuing to manage in this way we will greatly improve the conservation of the whole reserve. I am extremely pleased with these results. I am sure you will join me in thanking all the volunteers here for all their continued dedication and hard work in making Beacon Hill such a wonderful place to walk. Become a “Friend of the Biosphere” to connect with and support your Biosphere’s environment! 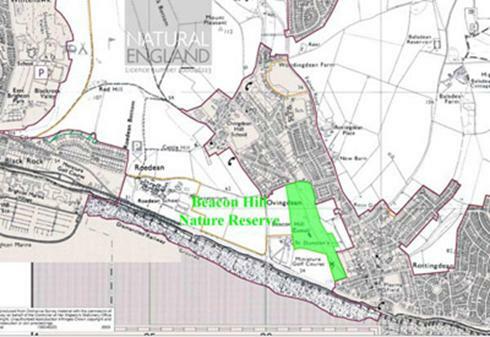 Beacon Hill was created a Local Nature Reserve (LNR) in 2004 and will fall within the South Downs National Park (the white area bounded by a red line on the above map). The management of this nature reserve is primarily to protect the habitat of the endangered skylarks by supporting a range of plants and butterflies associated with chalk grassland, as well as controlling areas of scrub and investigating archaeological features. Rottingdean’s windmill, which was erected in 1803, is within the boundary of the nature reserve. In 2005, Beacon Hill won the Royal Horticultural Society’s (RHS) Britain in Bloom Conservation & Environment award, and in 2007, the RHS Bloomin’ Wild Discretionary award. The nature reserve is an area of traditional downland, also known as chalk grassland, designated as typical CG2A specification, which is a priority European habitat. Chalk grassland is the product of centuries of sheep grazing. However, with changes in agricultural practices, most of these areas have disappeared while those that remain have often become isolated and neglected. Without proper management, the remaining chalk grassland will slowly deteriorate as nutrient levels build up favouring coarser species of grasses plus hawthorn, blackthorn, nettles, brambles etc at the expense of wildflowers such as vetchs and thyme. 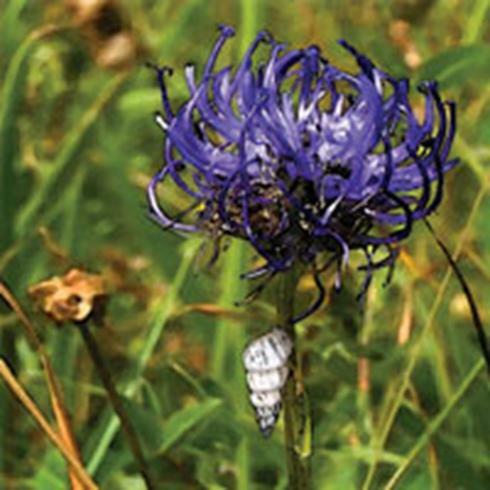 There is also a large colony of Round Headed Rampion. This plant is specific to Sussex and is known as the Pride of Sussex. For centuries the Downs around Brighton & Hove produced sheep and corn. The corn was grown in the valleys on the more fertile soils and the sheep grazed on the hills where the soils were thinner and less fertile.The arable fieldswere farmed in rotation with one field being left fallow each year. The sheep were brought down from the hills each evening by the shepherd and folded (penned) on the fallow field. The Sussex breed of sheep was bred to produce dung at night and thus they manured the fallow field, allowing it to be planted and cropped again next year. This meant that the fertility of Beacon Hill’s soil was kept low by the continual transfer of sheep dung to the arable fields. Thus, coarser species of grasses etc could not dominate and the downs became rich in a diversity of wildflowers with skylarks, butterflies, and other insects then benefiting from them. Over the last century agriculture has become industrialised and, with the advent of artificial fertilisers, farmers are no longer dependent on sheep grazing. This has seen 97% of the flower rich downland disappear in the last century. The remaining 3% is under threat from scrub spreading over it, eventually turning these areas into woods. Beacon Hill nature reserve is one of these small remaining areas that is in need of protection if we are to preserve it for future generations. 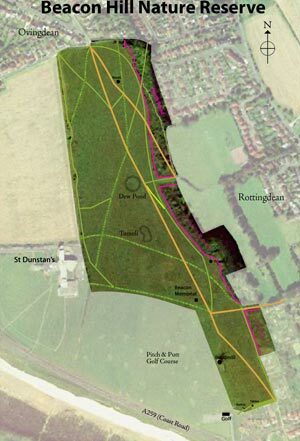 The LNR is owned by Brighton & Hove City Council, and managed by the Management Committee of Rottingdean Parish Council’s Beacon Hill Working Group. This Working Group includes representatives from the Parish Council, the City Council’s Countryside department, the Rottingdean Preservation Society, Ovingdean residents and Preservation Society, the allotments and our specialist recorders. Please follow the Countryside Code. Most of the area of the nature reserve is open access land with some young woods on the east side. Rottingdean Windmill is opened to the public over some weekends during the summer months. Three public bridleways (shown in orange) cross Beacon Hill from Sheepwalk in the south, Hog Plat from the Village and the Recreation Ground to Longhill Road, Ovingdean in the north. There are also several footpaths (shown in green) across the nature reserve. Please keep your dogs under control and stick to these paths so as to minimize disturbing the skylarks. In the sheep enclosure, please keep your dogs on a lead.